ASTM F3097-15 is a standard practice for installation of an outside sewer service cleanout through a minimally invasive small bore created by a vacuum excavator. The process begins with locating the service lateral pipe by use of a locatable sewer camera that is robotically launched from the main pipe. 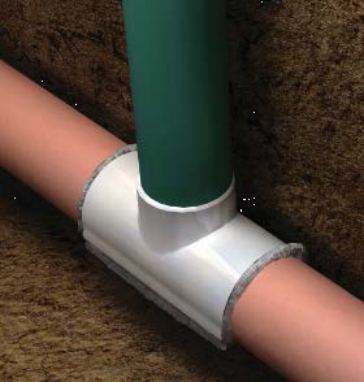 Once the lateral pipe is exposed, a self clamping saddle is prepared with a special adhesive and lowered into the small diameter bore hole until it contacts the lateral sewer service pipe; a downward force is applied to the riser pipe causing the side walls of the saddle to spread and encompass more than 50-percent of the host pipe. “We are very excited to have another one of our products comply with a very important industry ASTM standard. The VAC-A-TEE system, is yet another technology example of how LMK continues to drive the industry forward with high quality products", stated Larry Kiest, President of LMK Technologies. He further explains, “The utilization of this practice greatly reduces disruption to home owners and cities. By using this method, the installation of a cleanout has a nearly unrecognizable effect on the external surface of the ground, and most homeowners aren’t even aware that it has been installed.” The standard can be viewed and purchased at http://www.astm.org/Standards/F3097.htm.